Pleasing to the eye, pleasing to the taste buds, pleasing to the tummy…..Vegetable Soup. 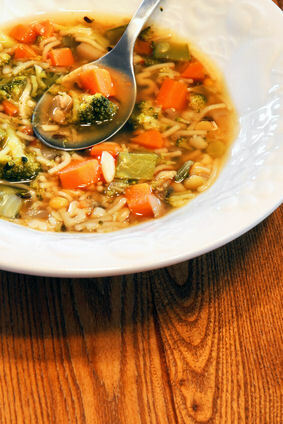 Try this easy Vegetable Soup Recipe. Vegetable Soup…. it’s a great nutritious pleaser at our house. We had another Souper Sunday Supper last night with a great big pot of Vegetable Soup! Sometimes it just good to go back to basics and there is nothing more basic than Vegetable Soup. We spent Saturday and Sunday afternoon getting ready for Hurricane Sandy. We never get anything like a real hurricane here because we are so far inland but we do get wind and lots of rain from a storm like this. Our preparation amounts to picking up anything that can blow around the yard and making sure that we have enough wood in the event our power goes out. Candles and oil lamps are strategically placed around the house, and then all we can do is wait. So we didn’t want a big meal Sunday night. We just needed something to warm us up and soup fit the task perfectly. I set the pot on the Vermont Castings Aspen Woodstove and let it simmer there. I enjoy cooking on our woodstoves as I feel we are getting more value for the effort that it takes to get our wood supply in. Here in the North Woods we lose power a lot in the winter and that back up energy source makes you feel real secure. Now back to the soup……..
You can add any vegetables you want. I went by what I had on hand. That’s the beauty of a soup like this; it uses up a lot of things you have hanging around in the fridge.There is nothing more fragrant than a pot of soup simmering on the stove. Always nutritious and a great way to use up leftover vegetables! In a large stock pot, melt butter and add olive oil. Add the garlic. Cook for 1 minute more. Add chicken stock, water, bay leaf, marjoram, and vegetables. Season with salt and pepper. This looks so, so good! 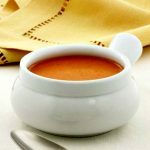 My son loves vegetable soup and it is fun to try different varieties! 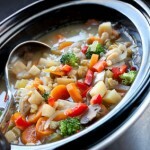 Your vegetable soup, looks really delicious. I especially like that you used orzo. My family enjoys vegetable soup almost weekly, it’s the only way I can get a couple of my children to eat their vegetables. Pinning for later. Definitely going to make this soon! Thank you for sharing at #OMHGWW! Looking forward to seeing you soon! Love that you get to use up what you have left over. Thanks for sharing. We LOVE soup…thanks for sharing your recipe! Louise, I love the color of your soup! The last couple of days have put me in Fall mood, and I am linokog forward to the bounty of the season.I always roast my pumpkin and squash for soup, but never tried roasting the onions. What a great idea, and a time-saver, too.I am spoiled from eating in season, fresh, natural apples in Serbia, and the big, perfect, glistening orbs do not appeal to me at all. Give something crispy, crunchy, juicy, a bit green, a bit red, and I am happy. Braeburn and Honeycrisp are my favorites.Great photos, as usual! The perfect way to utilize all of my CSA veggies 🙂 And the weather has just got cold enough to enjoy a bowl…or two! Yum! Love soup at this time of year. Thanks so much for linking up to Creative Thursday. Can’t wait to see what you share this week! Have a wonderful week. Looks amazing! perfect for fall! Looks great. I make soup almost every week now. Will have to try it. just made your soup last night- it was lovely. thknas so much for the recipe, it was just the thing on a cold night. returning from a long business trip to a mostly empty refrigerator (save a lucky butternut squash) almost kept me out of the kitchen but this was easy and quick to pull together with few ingredients. i added a shallot and some cloves of garlic. the leftovers today were even better! This looks delicious — I haven’t made veggie soup in awhile. I need to! These is really nothing better than a great bowl of Vegetable Soup, it is real comfort food for me. Hope you are having a great fall weekend and thank you so much for sharing with Full Plate Thursday. That’s a good lookin’ soup! I’m gonna have to ‘pin’ it if that’s OK for later reference. Thanks for sharing this! 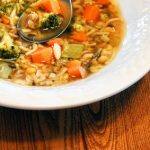 You can’t go wrong with veggie soup! Plan to try your recipe. Sounds good. So true! We love vegetable soup in our house. THanks for sharing at Must Try Monday! Yum! This recipe sounds delicious. Will have to make it soon as it is getting cold here in MO. This looks delicious. I didn’t realize how much I needed to add to my homemade chicken stock to make it soup. Thank you! YUM! Homemade chicken stock is so delicious. Not everybody makes their own so I wrote the recipe so they can use canned but homemade stock takes any soup to a whole new level! Your soup looks delicious! I think it’s very smart of you to have a back up power source. I am worried about some of my friends who are out that way. I’m glad that you’re prepared! Living where we do, you have to be like a boyscout and be prepared! In big winter snowstorms, our 1/4 mile driveway drifts in with so much snow so that we cannot plow it with our 4 wheel drive pickup truck. We have to hire a contractor to come in with heavy equipment to dig it out! Because his first priority is to get the logging company roads cleared, we have to wait sometimes 3-4 days before being able to get out to the “real world”. The power can go out for a day or two also. So living here makes you very self reliant!